Back to the giveaway. We published a new book which debuted at Market in Houston called SIMPLE CHOICES. We started with 5 different individual quilts blocks. Then we added 5 super fun appliques. We topped it off with two different trims, ric rac or raw edge. The idea is simple, CHOOSE YOUR BLOCK, CHOOSE YOUR APPLIQUE, CHOOSE YOUR TRIM, and before you know it you have 25 different quilts. We added something else to our website in November, LARGE RIC RAC. Yup, over 20 colors. We love Ric Rac and use it in so many projects, we thought we would provide easy access to lucious colors on line. 1. Check out the website, http://www.abbeylanequilts.com/, then choose the shopping page. 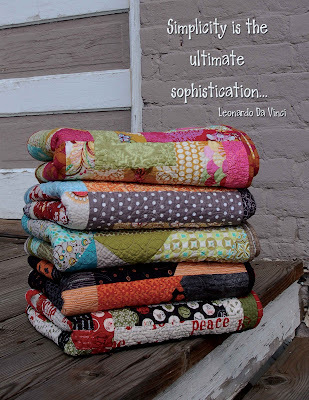 Got to the SIMPLE CHOICES page and pick your favorite BLOCK nd QUILT. 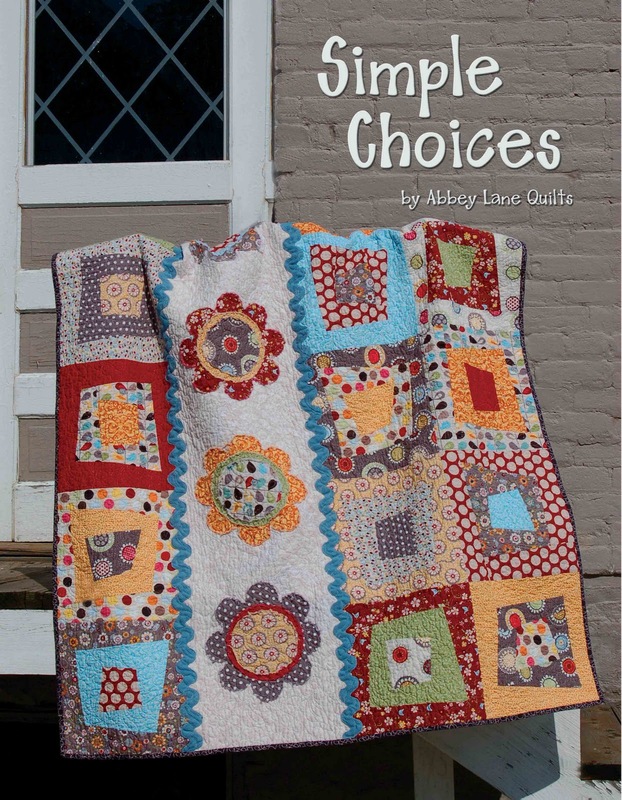 Remember, with this book, you get to choose and customize your quilt. Here is a quick sneak peak at the quilts. 2. 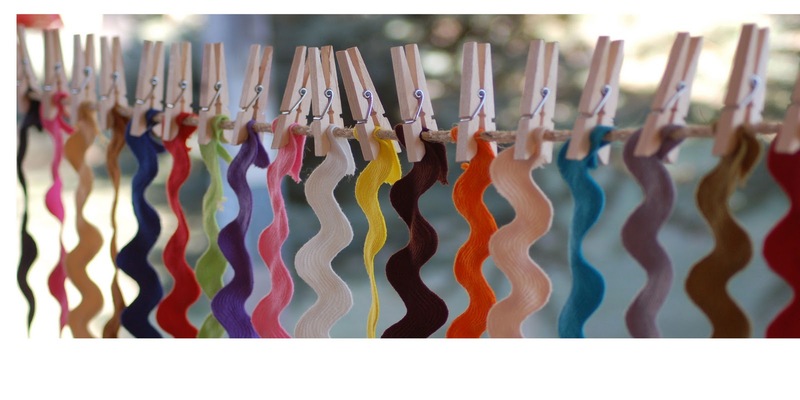 While you are on the shopping page, click on the RIC RAC and choose a color that would look great on your quilt. 3. Add yourself as a follower on our blog. For an additional chance, mention our giveaway on your blog. If you are already a follower, just let us know. 4. Friend us on Facebook at Abbey Lane Quilts. If you are already a friend, let us know. Post this giveaway on facebook for another chance. You will get a chance for each number you do above. If i counted right, you could get 6 chances to win. We will pick a winner next Sunday, so get your chances in quick. WE KNOW YOU WILL LOVE THIS BOOK. Congrats on the release of your new book! Simply Haunting is my favorite for sure. #1. My favorite block is Rail Fence and quilt would be Simply Anytime. 2. I really need the turquoise ric rac for my quilt. I think the butter ric rac is luscious! I am already a follower of your blog. Love your patterns. I am a friend on Facebook, too. 3. I follow your blog. Thanks for the giveaway! 4. I follow you on Facebook and shared the post with my friends. 5. I follow you on Facebook and shared the post with my friends. 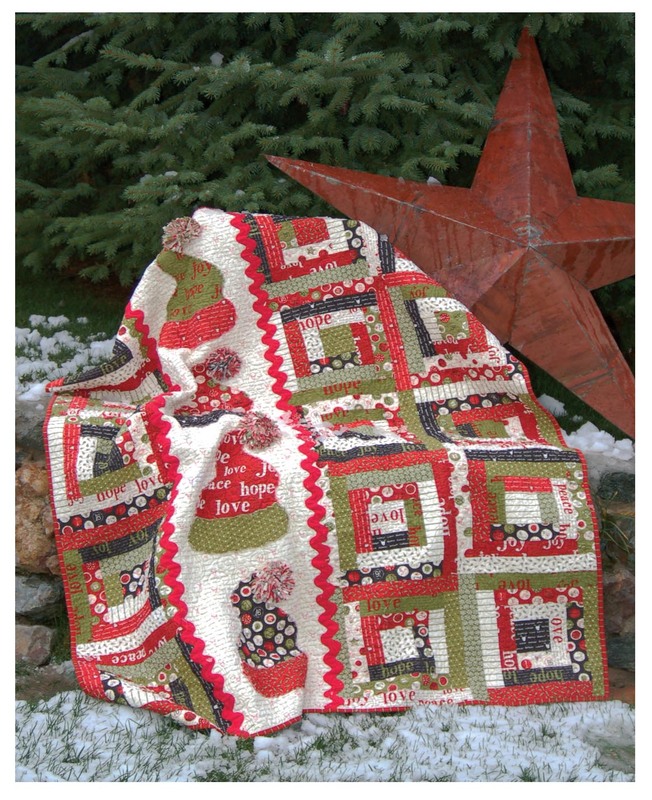 My fav is Simply Winter quilt and the Pinwheel quilt block. My favorite color of ric rac is the purple. So many ric rac choices! I'd have to go with the chestnut if I won. I have posted the contest on facebook. Fool On The Hill is the pattern I would pick. I love the design and fabrics used in the photo. Thanks for the giveaway! Definitely the orange Ric Rack! I'm in love with the color so this would be right up my alley. I like the Wacky Square block. The quilt would be "Simply Spring", Bright pink would be my rickrack choice. I'm already a follower on your blog, love the Pinwheel block, love the Simply Anytime quilt and love the Brown RicRac. Also friended you on FB!! I like the Pinwheel block and Simply Anytime quilt. :) Love the choices! What a fun idea! I love the Crazy Squares and the Simply Summer quilt! That Barn Red ric rac would be PERFECT on a quilt for me!!! Love the book concept too. It's one I'm going to have to look for. I love Simply Spring-the chickens do it for me. I would put bright yellow rick rack with them though. By the way, the book looks fabulous! If I don't win it, I might have to buy it! I'd like to intro myself: I'm new Follower #378. It was a hard choice - I really love Spring, but I'll go with Simply Anytime 'cause I love those circles. Log Cabin is almost always my fave block for any quilt. That Apple green ric rac would look great just about anywhere. I am your friend on facebook. I shared your giveaway on my wall on facebook. I love the tourquios ric rac! My favorite block is the pinwheel block. Thanks for all my chances to win! Friended on FB. And I should have said Simply Spring as it's shown, the the rail fence. Or log cabin. I like the pin wheel block and bright red rick rack. I have been a friend on fb. 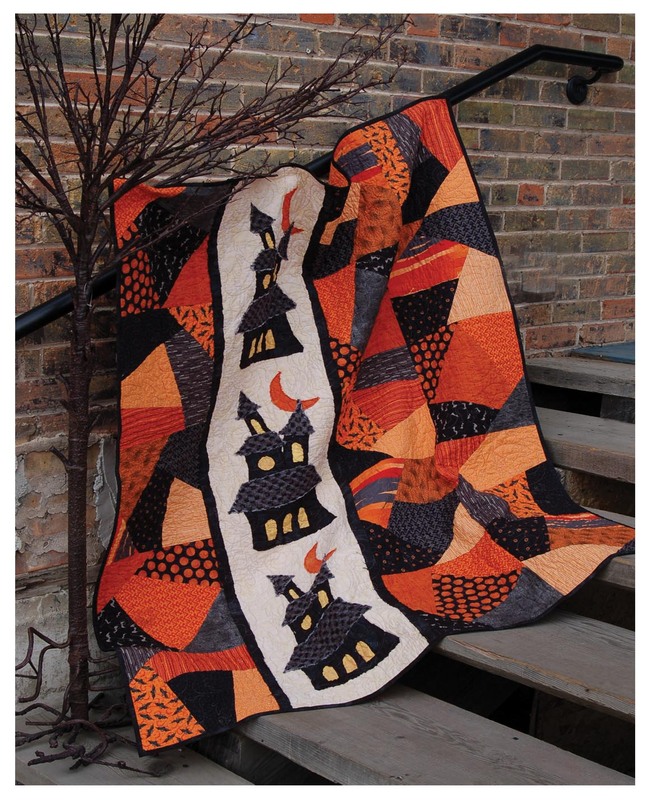 Simply Haunting is my favorite, since I collect Halloween quilts! Orange and black for ric rack!I am a following on FB and your blog. Thanks! Log Cabin and Simply Summer!!! I like the simple pinwheel with Simply summer applique. And bright pink ric-rac! and I follow you on facebook. Actually, I sent the friend request... and shared the link to the giveaway. Can't comment on your wall until/unless you accept my request! 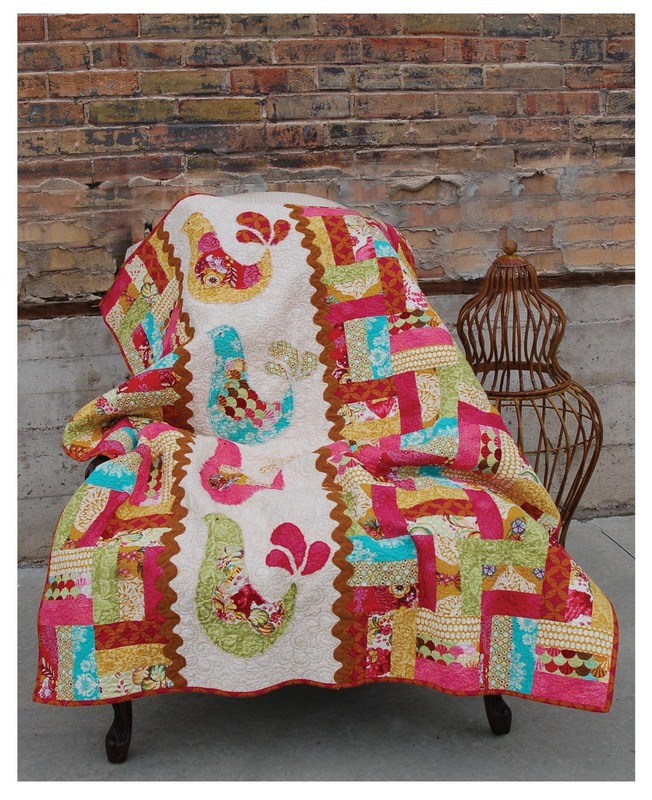 Love the quilts, my fav is the birds with the rail fence block! Your patterns are wonderful! I've got my eye on the Simply Spring Quilt! I would choose the apple ric rac! I love ric rac it makes me sooo happy! I love all your colors especially the apple and the bright yellow. I am already a blog follower & also a Facebook follower! LOVE your inspiring quilts!! I love the wonky angles of your Crazy Patch Block. 1. 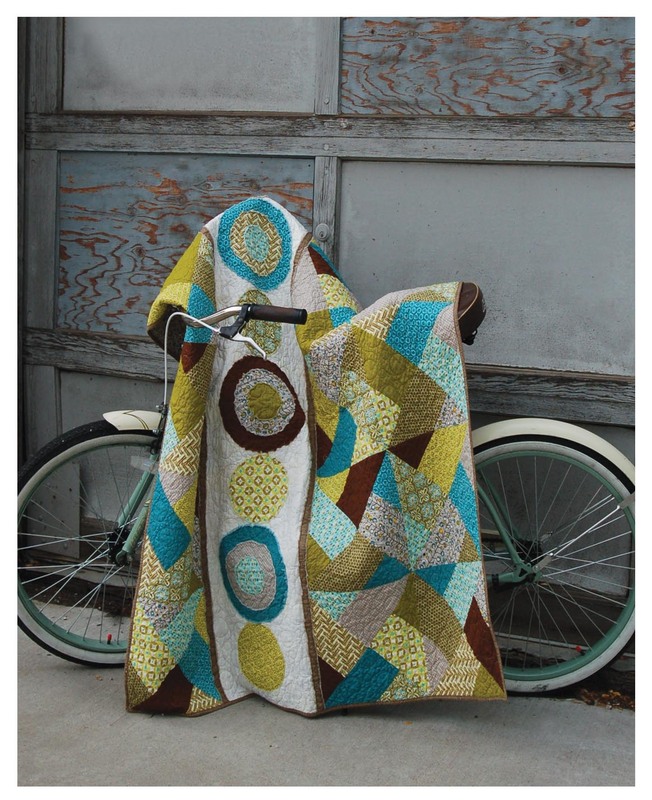 My favorite Block is Pin Wheel and my favorite quilt is Simply Haunting :) Thanks so much!! Turquoise ric rac would be perfect for my quilt in mind! Thanks so much! I like Abbey Lane Quilts on FB. The turquoise ric rac would be perfect for a Simply Spring quilt! I posted about your great giveaway on fb. I friended you on fb ... can't wait to see more! Posting/sharing the contest on my FB page.....thanks again! I shared your give away on fb! I am already a friend on facebook. BTW, LOVED the snow picture! Love the Spring. Turquoise RicRac for me and I like the giveaway idea. I won an Accuquilt GO Baby and can't wait to use it. My favorite block is the Wacky Square (I have never done anything wonky) and my favorite quilt is the Simply Spring! That grey rickrack is gorgeous! Oh, love this! My fave block is the wacky square and I just love the Simply Haunting applique! I am a follower on your blog! Can't wait to read past posts! I would use the apple ric rac with my quilt choices! OH! And I posted your info on my blog! 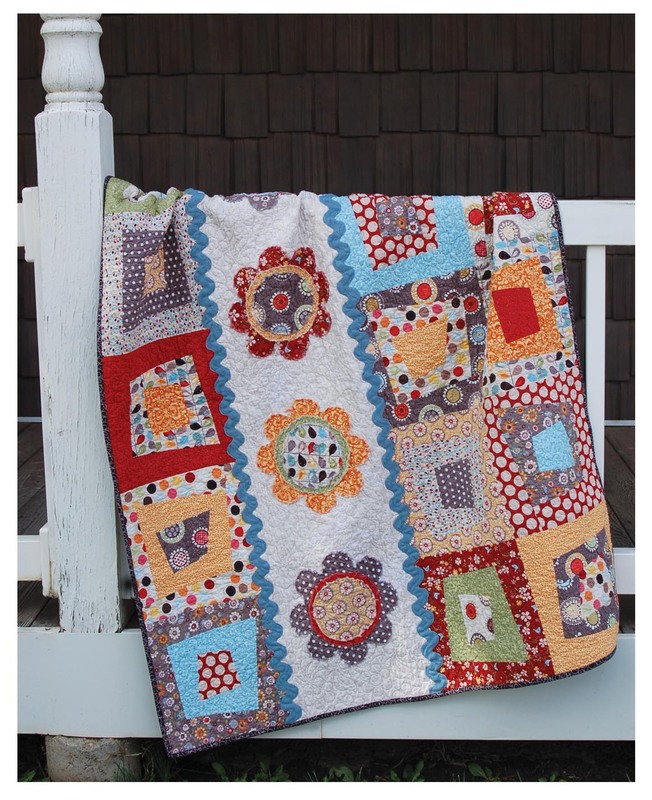 I like the Pinwheel block in the Simply Anytime quilt! I like the orange rick rack! I'm now a follower of the blog! Love it! Favorite block is the Wacky Square Block, favorite quilt is Simply Summer, and favorite color ric rac is Apple. Thanks for the chance to win!!! As for ric rac, definitely the Apple-- so bright and happy! I love this book! I would pair the Wacky Square block with the bird applique - probably in bright reds, yellows and oranges with just a touch of lime green - so I would need the Apple ric rac! I like Simply Summer and the wacky square block. Oh! I see that my RicRac choice was to be a separate comment to give me an extra choice....so Apple Green it is! I would probably pick apple green, bright pink, and purple rick rack. And I'm a new blog follower! Already following you on FB. Thanks for a chance to win. 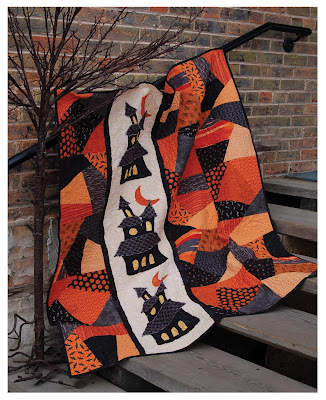 Simply Haunting looks like a fun quilt~they all look great!. This is a wonderful idea for a book. I have recommended you to my friends on Facebook! I just "liked" you on Facebook!! I already liked you for real though, LOL! I like the Pinwheel block, with the circles applique the best...but its such a cute idea, the mix-n-match! I love the Rail Fence and Simply Spring ! In fact, I love everything about the shown Simply Spring quilt. My favorite color in quilts is Orange, so that would be my ric-rac choice. And I love the Turquoise Ric Rac ! I was going to say the Orange, but I'd have to have just the right project for the Orange - the Turq would go with anything. I also added you as a friend on Facebook ! And I've just followed your blog too :) Great stuff ! I love the rail fence block. The book is wonderful and looks so much fun. I love the Simply Spring quilt. I've sent a friend request on facebook. I would use the butter ric rac I think but then that might change. I follow your block on GFC. I would choose Simply Spring. I would choose the Rail Fence block. I love the Apple Green ric rack. I sent a friend request to follow you on facebook and shared your giveaway. I love the simply spring.. just too cute!! Love the turquoise ric rac.. Thanks for the giveaway!! Simply Anytime is my favorite, but VERY closely followed by the Simply Spring! I "friended" you facebook, although for some reason I was already. Odd. My favorite block is the rail fence. It is simple to do but looks so cool to me!! I would choose the turquois ric rac to go along with my vintage groove fabric also!! Barn red rick rack makes my putter flutter! ps- I heart the Hanky Panky design, too! All your quilts are AMAZING! I have sent you a friend request on facebook!! I really like them all but I would start with Simply Anytime. So many pretty colors of ric rac to choose from but TURQUOISE it it. My favorite block is the Crazy Patch Block. Crazy quilts are always something I have wanted to make, but have never had the inspiration, till now! My favorite Quilt is Simply Haunting. How fun & imaginative! I am coming up with so many color choices for this quilt to make for Halloween 2012! My favorite ric rac is a tie between the orange and barn red. I can’t decide! I also became a follower of your blog!! ooh - i would have to make the crazy patch block (i haven't tried anything like that, and love the look)... and do it with the simply anytime. i think the wonky lines with the simple circles would be a really fun contrast! my favorite color rick rack would have to be the pink - i have two little girls, after all! I love Simply Anytime and the Crazy Patch Block! Thanks for this fun giveaway! What a great book! My favorite block is Rail Fence, and favorite quilt is Simply Spring. Love those birds! Ric Rac color? Purple, of course! LOL! My favorite block is the Crazy Patch block and I love the Simply Haunting quilt! My favorite ric rac color is apple. I love the Simply Spring quilt and pinwheel block. I like the turquoise ric rac.